This article explains two types of restrictions. Leave Restriction groups and Restricted periods. We will explain each separately. LeaveWizard allows you to restrict the total number of people off at the same time per workgroup, location or the entire organisation. The leave restriction group further allow you to define additional groups of people and apply a restriction on how many of them can be off at the same time. This could be useful for example when you have small number of specialists (e.g. HR) and it is important for your operations that at least one of them are always available. 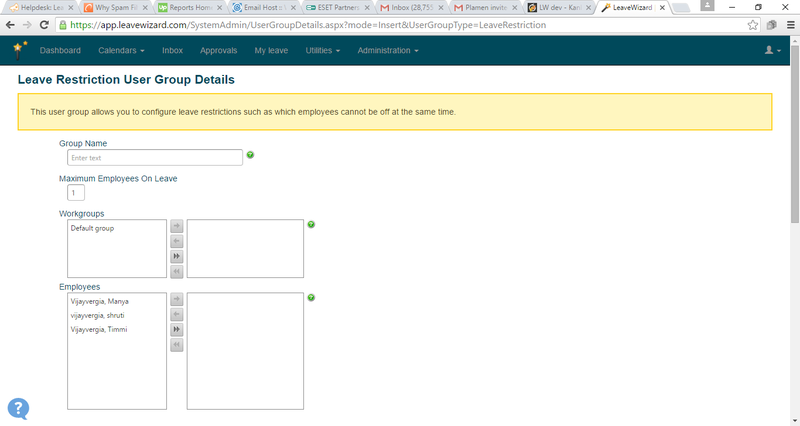 To set up rules like this one use the Administration menu and click on Leave Restrictions under Leave Type Settings. This shows you the list of existing restriction groups and let’s you add more. 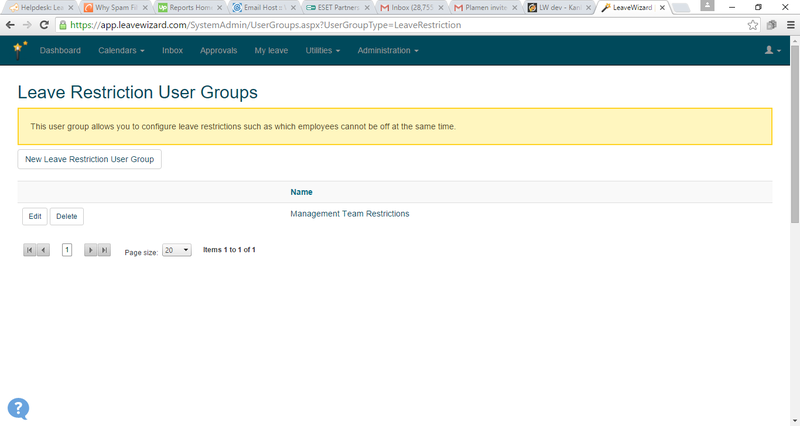 You need to give the group a name and specify how many of the members are allowed to be off at the same time. Then from the list of workgroups and employees create a sub-set by clicking the arrows to move workgroups or names from the left to the right list boxes. Once you are ready with your list click Submit, This will create your restriction group and whenever someone book leave will apply a rule of restricting the number of people members of you new group that can be off at the same time. You will see the list of periods with start and end dates and whether they apply to the entire organisation or a certain workgroup or user group. 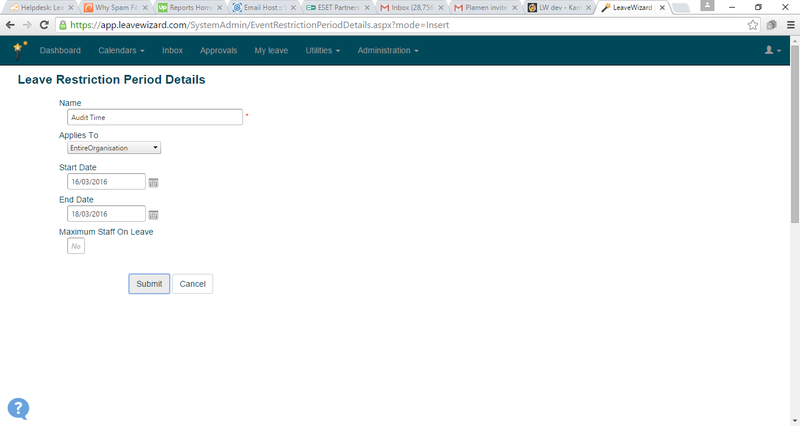 You can also edit or delete existing periods. 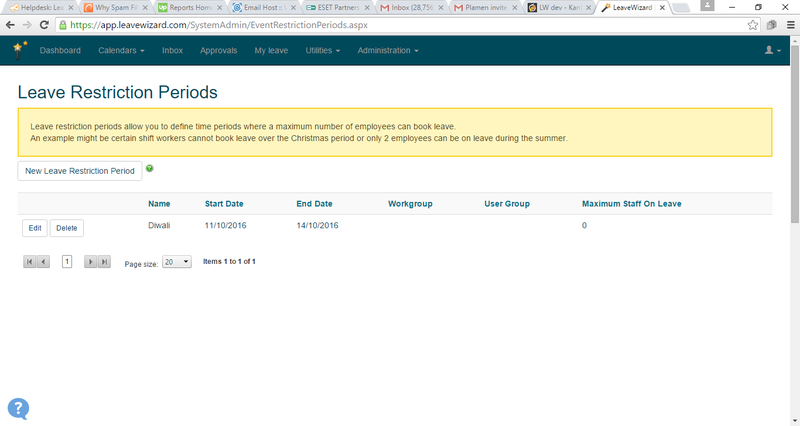 To add a new restricted period click the New button at the top left of the table. To add a new restricted period you need to give it a name, select whether it will apply to everyone in the organisation or to a workgroup or a user group and if so then select the target group from the additional drop down and finally select the start and end dates for your restricted period. Once ready click submit to save the changes. Once your restricted period is created members of the group you selected or the entire organisation will not be allowed to book leave during this period. Note that Administrators will notbe able to override this restriction.